Use of the rotavirus vaccine Rotarix in the US has been temporarily suspended because the vaccine was found to be contaminated with porcine circovirus 1 DNA. The discovery was made in the laboratory of Dr. Eric Delwart, who has provided insight into what was found in Rotarix, and why he was analyzing the vaccine. A little historical perspective about why we decided to analyze these vaccines even though there was absolutely no indications whatsoever that they are at all unsafe. Our intent was to use the latest technologies to show that live attenuated vaccine only contained the expected viral genomes and no other. The Delwart laboratory obtained samples of eight infectious attenuated viral vaccines from the manufacturers: oral poliovirus vaccine (OPV, Bharat Biotech), rubella (Meruvax-II, Merck), measles (Attenuvax, Merck), yellow fever (YF-Vax, Sanofi Pasteur), human herpes 3 (Varivax, Merck), rotavirus (Rotarix, GlaxoSmithKline; and Rotateq, Merck) and multivalent measles-mumps-rubella (MMR-II, Merck). The vaccines were treated with DNAse and RNAse to remove nucleic acids that are not protected by viral capsids. Nucleic acid was then extracted from the vaccine, amplified by polymerase chain reaction, and subjected to DNA sequencing. A total of 501,753 sequence ‘reads’ were done. The sequence analysis revealed the expected vaccine strains in each preparation, and in three cases, other unexpected viral sequences. The retrovirus avian leukosis virus was found in the measles vaccine, but at a very low level (700 nucleotides from 4 sequence reads). 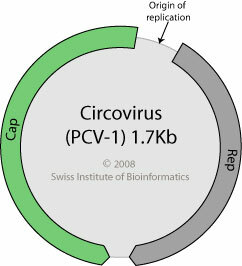 A virus similar to simian retrovirus was identified in Rotateq (276 nucleotides from 1 sequence read). Significant levels of porcine cirovirus 1 were found in Rotarix. The entire viral genome sequence was deduced from 6344 sequence reads, comprising over 40% of the reads done for that vaccine. The avian leukosis virus sequences found in the measles vaccine are in intact virions, as DNA treatment of the vaccines did not prevent their detection by polymerase chain reaction (PCR). However simian retrovirus DNA was not detected by PCR after DNAse treatment of Rotateq. Therefore the viral DNA detected in Rotateq vaccine most likely originates from host DNA present in the vaccine preparation. The cells used to produce Rotateq are Vero cells – African green monkey kidney cells. A defective form of simian retrovirus DNA, called proviral DNA, is integrated into Vero cell DNA. How did a porcine virus contaminate Rotarix, which is produced in Vero cells? The answer is not known, but the authors speculate that the culprit might be porcine trypsin, which is used during the propagation of Vero cells. Over 100,000 porcine circovirus 1 DNA molecules were detected in each vaccine dose, fully 10 times higher than the amount of rotavirus present. However, it’s not known if the porcine circovirus present is infectious. There is little evidence that the presence of porcine circovirus 1 DNA in Rotarix constitutes a danger. Because both porcine circovirus 1 and 2 are common in healthy pigs, it’s likely that humans are frequently exposed to these viruses by eating pork or when workers at swine farms inhale pig feces. Both viruses are often found in human stool. Whether or not these viruses can replicate in humans is currently a matter of debate. I believe that GSK and FDA are now testing whether PCV1 in Rotarix can replicate in human cells and/or determine if vaccinated children are sero-positive to PCV1. If those sorts of tests are negative it will indicate that PCV1 is most likely not infectious for humans and therefore not a health concern in Rotarix. For now it is my hope that people will not interpret this study as putting vaccines in a bad light but rather as reflecting the intense attention placed on vaccine safety using all the latest tools. It is only because of cheaper sequencing that these sorts of studies are possible. People should not be alarmed or over-react to every virus detection unless there is concrete evidence of human infection and pathogenicity. Viral metagenomics can both discover new viruses and improve the safety of existing vaccines. Its use early in the development of vaccines should help ensure their purity. Hey, do I get a prize for correctly guessing the experimental approach? We're all zoos, so I can buy some of Dr. Delwart's assurance of no automatic cause for alarm. But he implies the “latest tools” are consistently used to ferret out these passengers. You're probably familiar with the Virus and the Vaccine book on polio. They argued the the U.S. government doesn't make manufacturers use even PCR, and this was a key reason why that couple who lost a kid to SV-40 brain cancer failed in their lawsuit, even with Carbonne and the best defending them. Who's closer to the truth? Perhaps this virus came from the Trypsin when splitting cell lines at some stage? Do you know what the other 60% of reads comprised? In order to identify and be able to name contaminant viruses, you have to know what their genetic fingerprint is, and identify them against a reference virus. Was the other 60% junk DNA, so called because it doesn't match anything, and is presumed to be redundant? also… you say ” The vaccines were treated with DNAse and RNAse to remove nucleic acids that are not protected by viral capsids.” Were the vaccines also tested to find viral capsids which were not the primary vaccine antigen? Like all medications, there will always be a small percentage of bad batches. But this shouldn't deter anyone from seeking the vaccines they need. You really think that it is a “small percentage” and that you should not be “deterred” from getting vaccines???????? I think it's also worth making clear that the avian leukosis virus is probably only present in the measles vaccine because the measles vaccine is made in chicken eggs. The facility that makes the vaccine probably also uses ALV or its derivatives for routine transgenesis. I do it all the time! And ALV is avian specific, so there is no chance of zoonotic infection. Flumist, produced in chicken eggs. Others can use chick embryo kidney cells, egg albumin or egg/chicken protein. I have various books on culture mediums for various stages of vaccine production, and there are multiple steps in which all sorts of viral contamination is possible. But they missed the porcine virus from the trypsin. What else could they have missed? What else might deep sequencing have missed? I'm still interested in what the other 60% was in Rotavirus, – stuff they don't know what it is because there is no reference virus known as yet? I think Shia is correct. Its probably not worth worrying about as hopefully it can only be someone elses problem. Besides the costs involved to the manufacturer would be huge, better to bury the news and move on. You have to break a few eggs to make an ommelette. It is an important fact to consider for global health that the South African government's health services are NOT suspending the use of Rotarix, as the risk-benefit ratio is overwhelmingly seen as being in favour of the altter. That is, the vaccine will certainly save lives, while to possibility that it will do harm is seen as negligible. To the Editor: Madhi and colleagues (Jan. 28 issue)1 describe the effectiveness of a live, oral rotavirus vaccine against rotavirus gastroenteritis among infants in South Africa and Malawi. The vaccine had 64.1% efficacy against G1 rotavirus strains and 59.7% efficacy against non-G1 strains. However, we need to consider the prevalence of various strains before introducing the vaccine extensively in the community. A study in Bangladesh from 2001 through 2005 showed that the G1P strain was the most prevalent (36.4%), followed by G9P (27.7%), G2P (15.4%), and G12P (3.1%), but in 2005–2006, G2P appeared as the most prevalent strain (43.2%), and G12P increased in prevalence (11.1%).2 The recently licensed Rotarix vaccine includes only P specificity, with less efficacy against heterotypic non-P strains. The study by Kafulafula et al. showed that breast-feeding influences the rate of gastroenteritis in infants during the first year of life,3 although the authors did not report these results. The currently available Rotarix vaccine might provide good coverage against rotavirus strains that are prevalent in wealthier countries, but for developing countries like Malawi, we might need a vaccine containing different rotavirus strains. Who can know that they may turn into pig flu? Why should we accept to receive pig virus in our bodies? These companies are utterly cheap as they do not even use filters to or uv treatment to minimize contamination of the reagents used to propagate their vaccine strains. Or perhaps that's what makes the vaccine work better? NO need to add adjuvants as the pig viruses will do the job for thier vaccine! I agree, have we not learned anything from how non-plussed the FDA was regarding SV40. look at all the cancers that might be triggered from this. a contaminated rotavirus vaccine might make sense in the third world where children die from the disease but I don’t think taking that risk where children don’t is worth waiting 20 yrs to see if or what diseases being exposed to the porcine virus bring. The fda and the military defended the use of squalene as an adjuvant in the anthrax vaccine by quoting a cosmetic study, clearly there are factors at play here besides science.